As an experienced Buffalo Personal Injury Attorney, I get a number of calls every year from clients who are construction workers injured while they are working at an elevated height, or on a scaffold. It is called in New York State more commonly the scaffold law, but you have very special and specific rights that happen almost automatically if you’re injured due to a height elevated risk. If gravity causes injuries because you are working at a height and maybe there weren’t proper safety equipment, maybe the scaffold wasn’t properly secured, or the ladder wasn’t secured or a harness wasn’t provided. 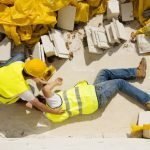 There are all kinds of issues that we look at, but essentially if you fall from a height and you’re performing a change or construction work to a building, then from the get go you have a claim for damages because at that point negligence is presumed by way of the construction law statute. Have you recently fallen off a scaffold and were injured at work? If so, contact experienced Buffalo Personal Injury Attorney Richard Nicotra.